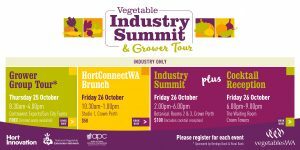 vegetablesWA is pleased to announce this year’s Industry Summit. This year we have a range of different events taking place on Thursday 25th & Friday 26th October. RSVP by Eventbrite no later than 17th October.